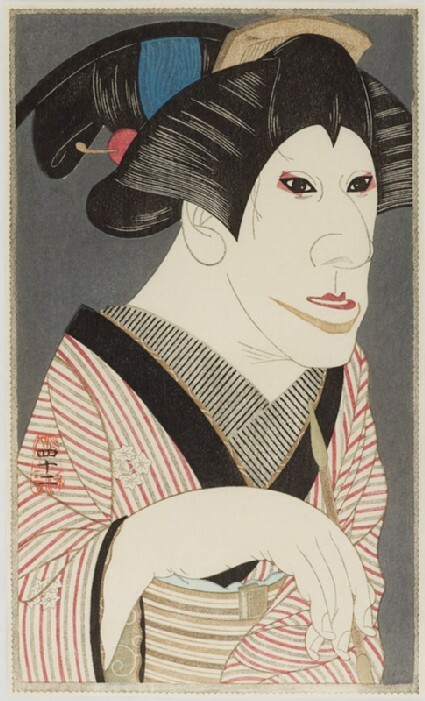 Tsuruya Kōkei’s prints evoke the works of earlier ukiyo-e artists, such as Kunisada and Kunichika (as you can see elsewhere in this exhibition), but they are particularly indebted to the actor portraits of the great eighteenth century print designer Tōshūsai Sharaku (active 1794 - 1795). Sharaku’s strikingly intense half-length actor portraits, often with highly exaggerated facial features, emphasized the individual personalities and idiosyncracies of the leading kabuki actors of his day. Kōkei’s yakusha-e continue this tradition but are not mere copies. Instead they embody a contemporary sense of irony and an element of caricature. Presented by Philip Harris, 2008.